I just came back to Palestine from aa high profile meeting on The World Beyond Global Disorder: Rhodes Forum (Greece, http://wpfdc.org/ ). It was a great productive meeting with hundreds of great attendees who shared their views on everything from political turmoil to refugeesexcept for an unexpected appearance of Russian billionaire Viatcheslav (Moshe) Kantor (representing European Jewish Congress) who hijacked the spirit of the meeting and lectured the attendees to promote his Zionist and Islamophobic views. No response or balancing view was allowed (see below for discussion of this disturbing incident). My speech (I skipped some portions of this in my delivered remarks due to time constraints. Thank you for your kind invitation to speak at this forum. I am honored and the settings are very beautiful. My only question is why this hotel has selected three channels from the area of WANA and the three are Al-Jazeera, Al-Masriuya, and Israeli channel 2. Do you have many tourists from Qatar, Egypt, and Israel? Anyway, I will not reiterate what was said earlier by the distinguished copanelists. The title of this session is which way WANA (really the Arab world) and on the cover of teh program book we are have "Beyongd Global Disorder". Yes we want to look for solutions and I am pleased that below it says "scientific program". I am a scientist and a medical geneticist. 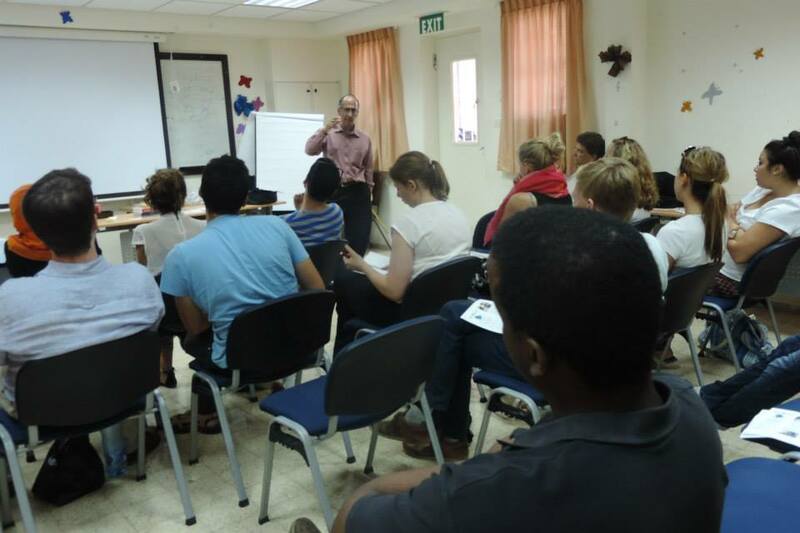 Having taught at Yale and Duke Medical schools and now at Bethlehem University in Palestine, I tell my students that our task is always to provide accurate diagnosis based on medical history and present symptoms, offer appropriate therapies, and give the prognosis. This can also be applied to social phenomena like the conflict in Palestine. 1840 British government contracts the services of Lt. Col. George Gawler to make a study on colonization by Jews of Palestine. He was selected because he was responsible for the penal colonies in Australia. Government adopts his recommendations to advance British Interests at the expense of the Ottoman Empire. The unifying thread of these key events was western support for fragmentation of the Arab world via sectarian and ethnic divisions spearheaded by the formation of a Jewish state in the heart of the area. Israel was created via armed invasion of Palestine and concomitant ethnic cleansing that left 7 million of 12 million of us as refugees or displaced people. 530 villages and towns were depopulated of their native and most wiped out. Massacres were committed (my mother’s school friend 18 year old Haya Balbisi was killed in the massacre od Deir Yassin). Massacres and state terrorism continue today with killing of unarmed civilians by trigger happy Israeli soldiers and colonial settlers, home demolitions, political imprisonment without trials and with ill treatment, prevention of rights of movement, religious rights, and other civil rights. Nearby countries were set-up by the west with dictators who overtly try to say they are for Palestinian rights but covertly work with the US/Israel (and they are the same since the US government is largely Israeli occupied territory to be liberated). I was not surprised then that the Arab Spring started. Mayhem rains at least partially because of an Israel lobby that pushed the US for war on Afghanistan, Iraq, Somalia, Syria, and now pushing for conflict with Iran. Much can be said about that but my time is limited and I do want to focus on Palestine. In Palestine we had 14 uprisings in the past 140 years (because social movements are never a straight line but go through waves). We are apparently at the beginning of a new wave. The two state solution is dead (I think was always dead and a mirage but even if you think it was alive, Zionism killed it). The apartheid system we have is even worse than in South Africa as testified to by many leaders from South Africa. 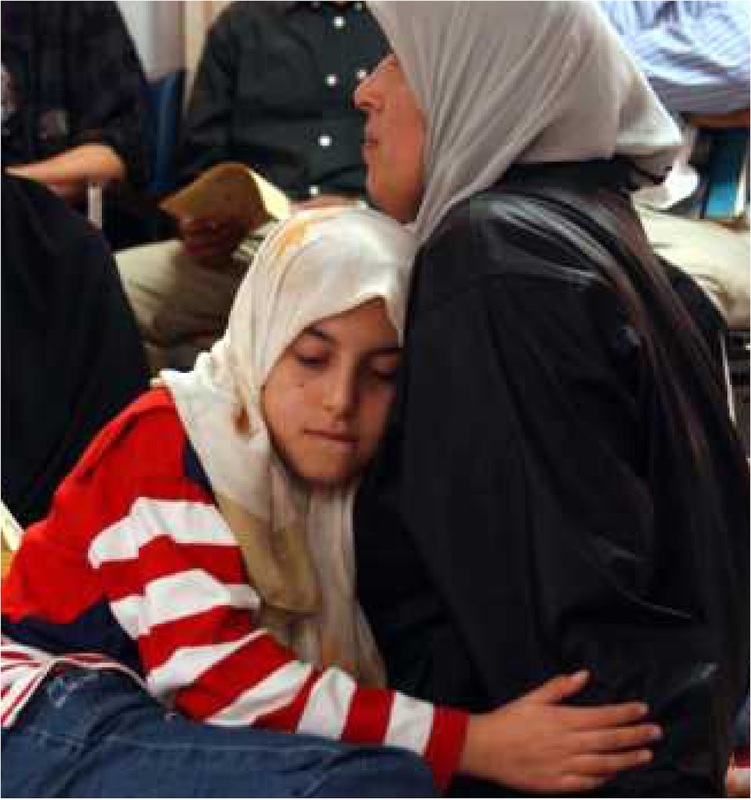 The resistance is the main form of combatting injustice, occupation, and colonization. I wrote a book on this (Popular Resistance in Palestine) and it was largely successful (here I gave a few examples). We also could use outside interventions just like we did with South Africa through Boycotts, Divestments, and Sanctions (BDSmovement.net). The fact that today 6.2 million of us live in historic Palestine with 6.1 million Israeli Jews suggest that Zionism has failed (past tense) to achieve its goals. That is thanks to this resistance. (more can be said here but look up the information). In short the prognosis is very Good but we have to pass through one more acute crisis. If we agree on the diagnosis being colonialism and racism (apartheid/segregation/hafrada) then we can think of models to stabilize (if not resolve) the conflict: Algerian Model (natives win), New Zealand/Australia Model (natives lose), and South Africa Model (compromise). For reasons I can discuss only the latter model is possible in the 21st century. (perhaps we can do better on the economic rights area). S a biologist now we are building a museum of natural history. Our motto is respect (for oneself hence empowerment, for others who differ from us hence diversity, and for nature). We scientists know that a sign of healthy ecosystem is many species with few individuals of each species while an unhealthy ecosystem is dominated by one or two species. Same for human societies: health societies have a diversity of backgrounds and beliefs and Palestine will go back healty once we discard the notions of chosenness, a “Jewish state” (or a Muslim or a Christian state) and accet plurality and equality. While I appreciate conferences and academic papers, I am a grassroot activist and organizer (I was arrested several times by Israel). Many of ending charges against me have to do with incitement. So here I am inciting you: ACT. A Chinese saying is “I hear and I forget, I see and I remember, I do and I understand”. I urge you to come see for yourself and then I urge you to act. You can’t be neutral on a moving train as Howard Zinn said. Read Martin Luther King Jr letter from Birmingham jail to understand why he and many of us today believe apathy is far more dangerous than those who oppose human rights actively. Perhaps the best thing about this conference is meeting many of you and I hope we can develop further collaboration in the months ahead. The reality is that Kantor and EJC do not speak for European Jews as they claim. Many European and other Jews are horrified at Israel's crimes. For a partial list of decent Jewish organizations who disagree with Kantor libelous accusations [see 2]. Much more can be said about Mr. Kantor [e.g. 3]. Perhaps The reality is that over 300,000 Israeli Jews moved and now live in German! Kantor commanded us that anti-Semitism should be "punished in Europe more severely than ordinary crimes" and that Europe should watch out for perhaps 500,000 of “those people” (Muslims) are coming with different cultures and would start violence because they have “different culture”. He claimed all sort of other unsubstantiated claims. No one was allowed to rebut him. Russian born Israel Shamir and I tried but we were told the conference is over and we can send our remarks by email (this is what I am doing but to a slightly larger email list). I believe in speaking truth to power and I believe in the idea of the Rhodes conference of a dialogue of civilizations (though I believe we are all one civilizations but with many ideologies and ideas). it is important to say positive and perhaps the organizers can create some positive energy when they get feedback. Perhaps they will invite me for a debate/dialog with Kantor next year where attendees are afforded the chance to really discuss real anti-Semitism versus imagined one, discuss Zionism, and more. In the meantime we need to continue to act. Seventy years ago at the height of the human induced tragedy called World War II, two bombs ("Little boy" and "Fat man") were dropped respectively on Hiroshima and Nagasaki. 250,000 human beings were incinerated to death and hundreds of thousands died slow deaths later with radiation poisoning. It was an unspeakable act of state terror still unparalleled in human history. It was politically motivated to sen d a signal to the Soviet Union. The lessons were not learned and today nine countries have arsenals of nuclear weapons (US, Russia, China, France, England, Pakistan, India, Israel, North Korea). A fraction of this arsenal is enough to wipe out human life on earth. Burning people alive continues ofcourse though on "smaller scale" and the West seems to ignore this. 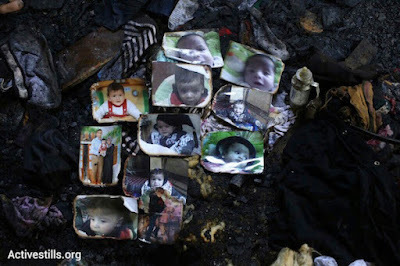 Take the burning of the Dawabsheh family in Duma (near Nablus in Palestine). Father and 18 month old died, mother and second sibling still in bad shape in the hospital. 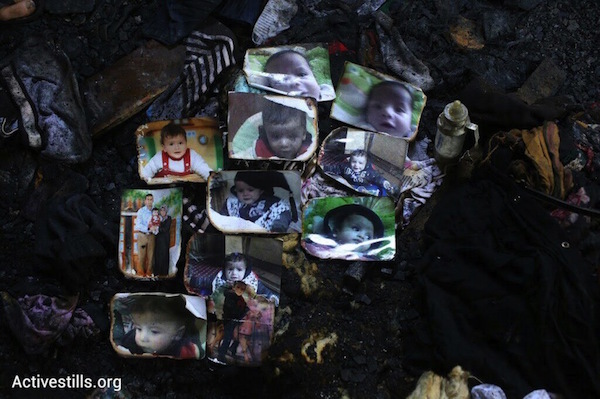 Perpetrators funded by the Israeli government are still unpunished. 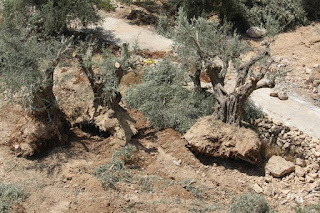 Yesterday morning the army of the colonial new "Jewish state" of Israel, 68 years of mayhem in the building, destroyed 15 ancient olive trees dating back 2-3000 years old in Beit Jala. The reason? 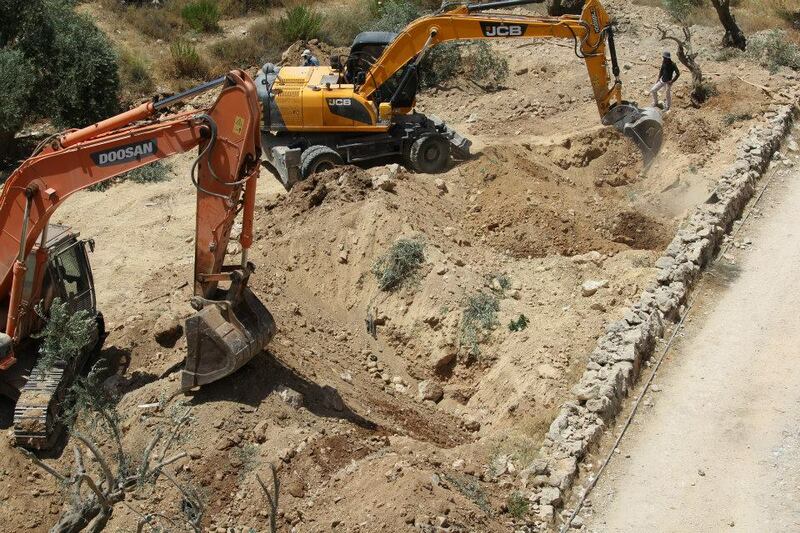 Israel is going to close off the most fertile valley of Beit Jala western Bethlehem (Wadi Abu Ahmed, Cremisan area). Closing it off from its owners (55 Christian families of Beit Jala) is a step in confiscating it as happened before in thousands of locations. The world community and the Palestinian authority ignore the continuing massacre of land and people while occasionally making meaningess "statements". In practice though, the Western governments support Israel and have close working ties with it (thus are co-conspirators in the crime in the legal sense). But I do want to focus on the Palestinian authority (PA) and will argue that it is the biggest enabler of the occupation today. Let us start for the history creation of the PA. The idea of a self-governing authority in teh heavily populated centers of occupied Palestinian territories was an Israeli government idea adopted after a commission was created headed by General Yigal Alon in 1968 immediately after conquering these areas in 1967. After the 1973 war and the US interventions clearly acting on behave of Israel (Henry Kissinger,Arms shipments and other support that saved Israel), the "compromising" ("compromised"?) faction of the PLO decided to move to get the Western governments primarily the US to accept them. The ten point program in 1974 and the "declaration of Independence" in 1988 and the Oslo process in 1993 where all steps on the downhill course to implementing the Alon plan. Oslo succeeded brilliantly in fully "domesticating" the PLO and finally rendering it a meaningless shell and replacing it with the PA, a subcontractor of the Israeli occupation. The nepotism and corruption of the PLO hierarchy under Yasser Arafat where the only real inheritance passed down to the PA. Money and jobs and privilege became the currency of those whose parents and uncles and friends suffered and even sacrificed their lives for. The latter believed in revolution and resistance, the former believed in endless talks and sacred security coordination with Israel and the US. Does anyone even wonder how is that in 1993, 150,000 settlers lived in these occupied territories and many of them were afraid for their lives and required armed escorts. Today in 2015, 650,000 colonial settlers are here and they live with impunity even burning Palestinian families alive. This is squarely the responsibility of the process described above and its fruit the PA which remains paralyzed to do anything and relies on the excuse of division between Fatah and Hamas. This was not some unforeseen outcome. The Palestinian advisers and other experts involved with the political leadership did warn of this. Some of these advisers left the "negotiations" in disgust and have nothing to do withe PA. Some to them realized they can do nothing but decided to get on the wagon of privilege and power and were thus co-opted by the Alon-plan's fruit, the PA. In the case of the wall that the International court of justice rule to be illegal in 2004, it is still being built on Palestinian land and the only way to stop it it is to end the mental occupation. d) The "why rock the boat" attitude combined with lack of belief in others (PA officials always tell me the Palestinian people are hopeless and tribalistic and weak etc). In my book on "Popular Resistance in Palestine: A history of hope and empowerment" I explain why such corrupt leadership eventually fades away and that people make their own history. Every day I see examples of heroism and self-sacrifice parallel with examples of cowardice and mental occupation. But those who put their personal interest ahead of their people interest are also fighting with each other over a shrinking "pie". History will disgrace them. Our job is to help people shed this mental occupation and arise from the ashes. The screams of women defending the Aqsa compound echo with the screams of the children burned alive and of the land owner in Beit Jala as he watched 2000 year live trees uprooted. These echos say "wake-up" and "fight". After all what choice besides living and fighting with dignity or living as slaves mentally occupied in fancy offices in Ramallah and elsewhere. If the PA leaders want to reclaim a shred of decency, they would go in front of the bulldozers that even today demolished a home in Jerusalem and they would be arrested instead of begging the occupiers for crums. 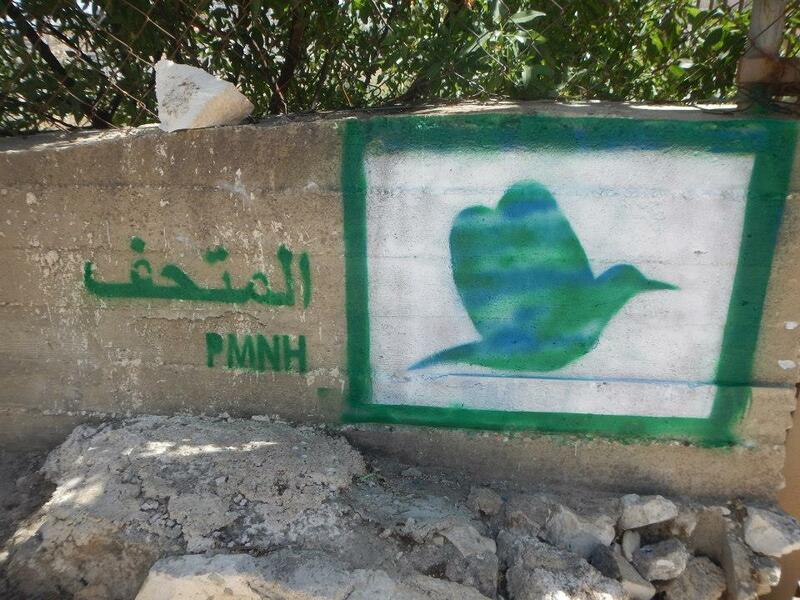 Remember the South Lebanon Army! Arise and reclaim your dignity! PS: in local news, we continue to receive numerous delegations every week at the Palestine Museum of Natural History, we continue to join action, we continue to learn and teach, we continue to grow (with many volunteer and donor help), and we continue to research and try to conserve biodiversity in our small area of this big beautiful planet. To stay abreast of these development please join us on facebook under Palestine Museum of Natural History. Life here goes on in all its ups and downs. On the down side we noted with dismay how Mr. Jibril Rjoub decided unilaterally to capitulate to the Israeli government and not pursue them in FIFA (Fédération Internationale de Football Association) even though they violate basic human righst including rights of athletes. The capitulation decision was with no democracy, no consulting of people (even our own athletes). There is an Avaas campaign to gather signatures to "red card" Mr. Rjoub (see https://secure.avaaz.org/ar/red_card_rjoub/?rc=fb&pv=61 ) . This is one of a series of setbacks that keep proving that the Oslo process was indeed a second Nakba for us. It created a cadre of benefited elites who for the sake of PR must keep speaking as if they are against the occupation but in practice facilitate and entrench the occupation/colonization. Questions for philosophical thought to the likes of Jibril Rjoub: who was the women who refused to give up her seat to a white man in a bus in America? Now who was prime minister of England at the time or minister of youth or athletes etc? Who made the difference and who is remembered? In 50 years who will remember you and if they do how will they remember you? How do we remember Vichy or Buthalesi? We think philosophically of how many humans are weak and do not show a backbone. They do not respect themselves or believe in themselves. They get down the slippery slope of "getting along" to advance their individual financial or personal ego interest. Jesus said "what good is it for man to gain the whole world and lose himself". I have compiled hundreds of such examples maybe for my next book. On personal news: I finished writing a chapter on BDS (boycotts, divestments and sanctions) highlighting opportunities (e.g. with churches) and challenges (e.g. with Oslo and the PA structure). I also finished two reports. I am going to Amman (3 days) for a conference on biodiversity then to Marseille briefly (2 days) for a conference on climate change. Next month to Germany. Biggest challenge is shortage is time. Biggest opportunity/pleasure is working with youth. Come visit us in Bethlehem under Israeli apartheid. Compassion fatigue is a term I heard many years ago perhaps when there were a number of natural and man-made disasters and conflicts in the late 1980s. The term came to my mind in the last few weeks. Another saying: think globally and act locally. So thinking globally, I was thinking how humanity could descend to such barbarity around the world. How could African migrants risk their lives to leave countries wrecked psychologically and economically by colonial Europeans to seek to arrive in the same continent that subjugated them? How could Myanmar’s Rohingya Muslims be slaughtered in the thousands by the majority Buddhists and surviving people end up in boats and sent back to starve and die at sea rejected by nearby countries including countries like Indonesia with Muslim majorities? How could relatives of Jewish holocaust survivors engage in racism and ethnic cleansing for native Palestinians while relatives of Armenian holocaust survivors lead amazingly rich productive caring lives? How could a very wealthy country like “Saudi Arabia” (the quotes are needed because it is an imposed name for a country stolen by the Saud Family) spend billions to support the US/Israeli agenda of destruction and mayhem in countries like Yemen and Syria? How could a pilot who claims being Muslim drop bombs on Muslim civilians? How could a powerful and rich country like the USA be so occupied by the Zionist lobby that they send their “police” to train in racism and oppression in Apartheid Israel and then go back to kill blacks in American cities? How does the world tolerate the continued siege on Gaza and its starving and dying population (the largest open air prison with 1.7 million inmates whose only crime is being born in Palestine)? 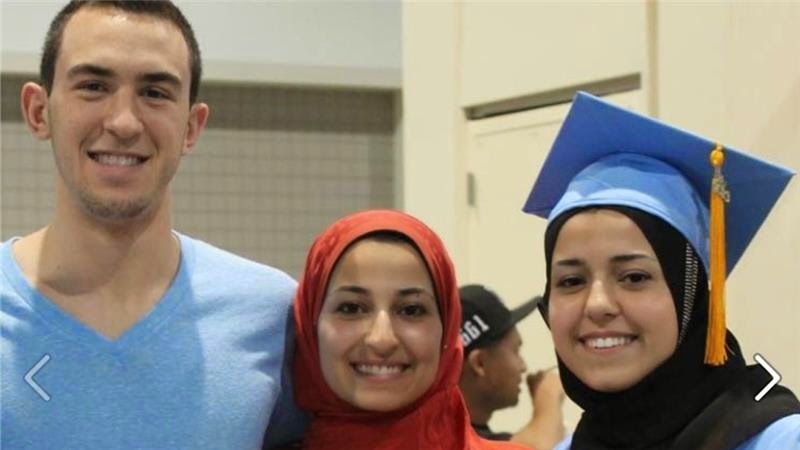 How could the world stand by and let Egypt execute political dissidents or imprison them for decades simply for demanding freedom from the entrenched military dictatorship funded by US taxpayers? The US and Canada Zionist lobbies just might succeed in getting unconstitutional laws passed to ban standing up for human rights (supporting BDS against the apartheid regime). It might get worse with the lobby getting the subservient governments to force the political neutered Palestinian leadership to accept a version of apartheid (and no refugees’ right of return). But then that is what the PA leadership knew would happen when they signed the articles of surrender known as the Oslo accords. So did humans develop compassion fatigue and does this bode ill for our future as a species? I do not know and cannot predict the future. I can only act against the negative trends and draw closer to other activists. When we do find people who still cares, we latch onto them and try to do something together to keep our sanity. 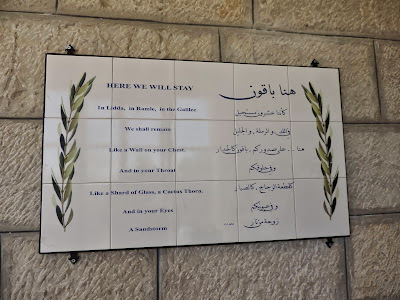 Palestinians were genuinely happy that the Pope decided to canonize two 19th century Palestinians nuns as saints and conclude an agreement recognizing “state of Palestine”. Those positive people trying to do good things are so needed when so many are either apathetic or directly benefitting Israel while getting rich. Without the few lights in the darkness, we would all be lost and very depressed. Perhaps this is why the presence of volunteers around us in the museum and the botanical garden/integrated ecosystem is so crucial to our health. When we walk or work in the garden with others, we feel reinvigorated physically and psychologically. In fact when we do any work together, we feel empowered. 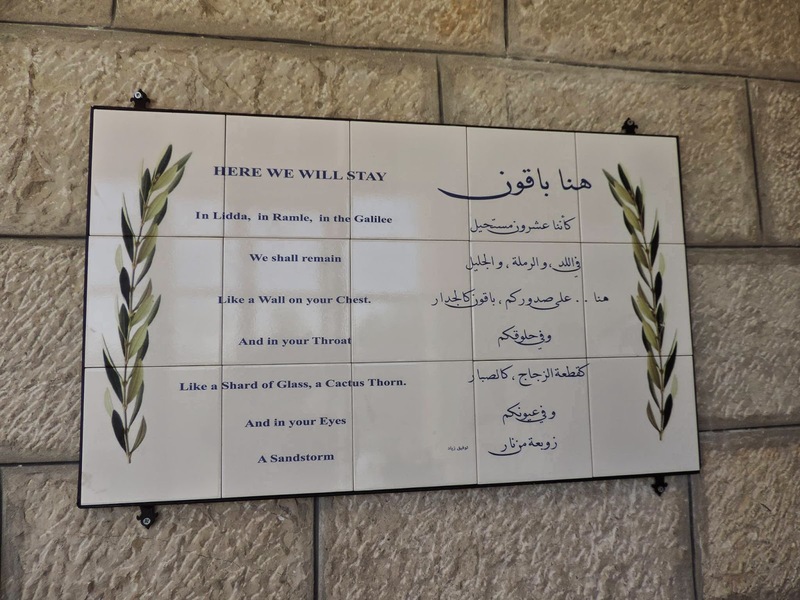 On Nakba memorial day last week we had a number of activities including installing a large visible plaque that included sections of the famous poem by Tawfiq Ziyad (“here we stay”). The next day, we hosted a workshop on trauma relief through herbal medicines and working on gardens. We then hosed 44 Nazareth colleagues on a tour of Battir then lunch at the museum. Yesterday we attended a meeting on biodiversity, did field work and got two Bedouin children to help us near their camp by picking up some round rocks we needed for our pool at the museum. They were so nice and so friendly and their smiles even after the sweaty job will always be with me. Their community spirit is strong even when they are threatened as a community with evictions (was done to them before). So while thinking globally we are able to act on location and keep going based on a vision that all these borders and divisions and conflicts they foist on us will be gone one day. We dream of an interconnected free society and of traveling free from Bethlehem to Jaffa to Nazareth to Beirut and Damascus without anyone stopping us at any border. On my desk is a quote from the Dalai Lama “Never give up. No matter what is going on around you. Never give up…” Sometimes we do not know the best way forward but we should never give up. I have a friend in Gaza whose son had spinal cord cancer and now partly paralyzed and the family constantly calls for support. But that is one of dozens of stories, needs fulfilled or unfulfilled etc. It is natural occasionally to have doubts about our future as a species and frequently to reassess our methods. But we must keep the hope alive. We must keep dreaming, keep trying, keep working, and keep living. We must never give up. We must “stay human” as Vittorio used to write to us. The kingdom of "Saudi Arabia" is going to behead a man for "apostancy" (renouncing his belief in Islam and the Quran) while welcoming Egyptian Al-Sisi whose security forces are torturing people to death in Egypt for being supportive of an Islamic political system more moderate than that of that Kingdom! Meanwhile the Egyptian kangaroo courts are declaring resistance movements outside of Egypt who have little to do with Egypt to be terrorist organizations. Sisi is also helping Israel enforce a siege on 1.6 million Palestinians (now that is terrorism). The Jewish State in Israel and the Levant (JSIL) in the name of ancient mythologies is using colonial settlers to kill natives, ethnically cleanse them, and torch churches and mosques with impunity. 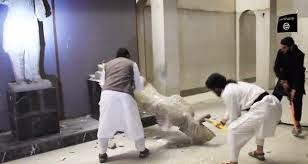 Meanwhile their progeny ISIL loots and destroys priceless human heritage going back thousands of years. It started in 2003 when US invaded Iraq and its soldiers sacked Baghdad. US soldiers were instructed to go and protect the ministries of oil and internal security but allowed pillaging 15,000 priceless archaeological artifacts from Baghdad. At that time I wrote warning that the plan was to break-up Iraq by encouraging sectarianism (until then unknown and people living harmoniously for hundreds of years). Ashurian and Babylonian and Sumerian cultures were perhaps more civilized than our current "civilization" (based on monotheistic "religions" or on secular traditions). It is no wonder the remannts of those are being destroyed in Iraq in favor of the new idols (Netanyahu and Zionism). The congress of the strongest military power on earth (the USA) funds regimes that commit Nazi-like atrocities around the world. Israel gets the lion share of this (several billion annually). Netanyahu will try to justify genocide and ethnic cleansing of Palestinians and others. Republicans and some democrats will listen to Netanyahu call for yet another war for Israel. Zionists pushed for the catastrophic war on Iraq and Syria (Mesopotamia) and now are pushing for an even more catastrophic war on Iran (ancient Persia). Persian history and archaeology maybe destroyed like they are now doing for Mesopotamian history. Many of the bible myths are taken from ancient Mesopotamian and Persian stories recounted >1000 years before they were taken by the writers of the Bible/Torah (the stories of Adam and Eve, Noah and the flood, Abraham and Sara, Moses and an "exodus"). Perhaps the selective historiography while destroying records of earlier periods of human history is useful to those who want to use their religious narrative to rule. But it seems also useful for those secular people who want to advance hegemonic racist ideas. But it is not just history but the fragile environment that is targeted (see below on Red-Dead canal). Hypocrisies and atrocities go on daily in this "Middle East" thanks to all the weapons pouring in from countries that claim they want peace. The USA is the largest weapon exporter in the world and most of it comes here. Here is a novel idea if we want peace here: A total arms embargo on shipments of weapons to all countries in the Middle East (Israel, Egypt, Saudi Arabia, Syria, and others). Spending one percent of that money on human needs instead of on promoting killing would go a long way to reclaim our humanity. Here in ocupied Palestine, we are trying on a small scale to resist. From the Friday demonstrations in several village (this was tenth anniversary of the demonstration in Bilin) to trying to open Shuhada Street in Hebron (closed to punish Palestinians after a Jewish racist settler massacred dozens of Muslims at the Ibrahimi mosque) to daily sumud stories (we are planting hundreds of trees weekly) to education and research....Life goes on.